As many of you know, we have been referring back to a Portuguese wine organization called, Vini Portugal, throughout this entire month of August without disclosing too much. Part of the reason we haven’t previously gone into further detail as what Viniportugal does as an organization and why they’ve made an impact on our lives, is because we wanted to focus one full article on the subject. In the past two years of dedicating our lives to Spanish and Portuguese wine, we’ve rarely come across an organization that has both impressed and emotionally moved us. The general trend we’ve experienced when asking for information or visiting their office is that help is given on their own time, in their own manner, but rarely with the perspective of the customer/learner in mind. ViniPortugal works from a completely different framework. Our experience with this organization began with an email. A few weeks before our scheduled flight to Lisbon, we emailed Vini Portugal requesting help in organizing a tasting of Portuguese Table wines during our short 3 day stay. They eagerly responded that they would do whatever they could to help us, contacting us in a few days with a potential time and date. The next email we received warned us that our initial prediction of meeting a handful of producers had now turned into a dozen with anticipation that more would be arriving without prior confirmation. Who does this? What organization goes out of their way for a blog who has spent the last year almost exclusively focused on Spanish, not Portuguese wine? Shocked and a little star struck, this announcement was followed up by an email from the president of ViniPortugal asking me if all the arrangements were to my liking. Excuse me? To my liking? You’ve just organized a large impromptu Portuguese wine tasting with over 40 wines from all over Portugal for us to taste and you’re wondering if I’m happy? Dude, I’m ecstatic! Upon getting out of our cab the morning of the tasting, clueless as to exactly where ViniPortugal’s Sala Ogival was located in the plaza, we decided to make a bee line to the the big “Tourist Office” sign located just off the main promenade. We figured that if our wine sixth sense was not working appropriately, these fine people at the tourism office would have the means to get us on the right track. As we were about to enter through their glass doors, we spotted a tall red head a few stores down looking bit anxious. So, we did what any logical person would do, we gambled! Walking closer to her, her big eyes fixed upon us as a warm smile crept upon her face. Maria Joao Menezes was the Managing Director of Vini Portugal’s Lisbon Sala Ogival. 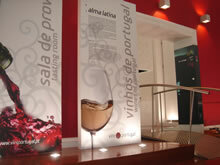 To clarify, ViniPortugal has 2 established “tasting” locations in both Oporto and Lisbon named Sala Ogival. 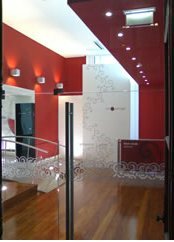 Maria Joao has been working in the Lisbon location afor over a decade, nurturing and developing its growth. Part of what makes this organization so incredible, is her. She is a passionate, forthright, assertive soul who loves and takes pride in her country. You can see it from the moment you meet her. Without hesitation. Without missing a beat. She’s the type of person that will make you laugh, cry and get fired up all in one breath, no matter what aspect of Portuguese wine you may have been chatting about. As she guided us through the front doors and into the main salon, I was immediately under the impression that this was a fully funded private organization from the amount of detail and design put into every aspect of the space. What I learned is that, technically, it’s a private organization that is partially funded by the government. It’s creation stemmed from a serious need to market Portuguese wine both nationally and internationally. Founded in 1997 as an inter-professional organization, it has striven to promote Portuguese wine through one tenant, education. Their belief, as perfectly exemplified by Maria João, is that by educating each and every individual that walks through their doors on the diversity, history and tradition of Portuguese wine, they will also be educating the world through viral marketing. While explaining the mission of Vini Portugal, Maria Joao’s eyes seemed to get bigger and filled with excitement, her gestures more pronounced. She besieged us to understand that her role was not to inundate my palate with Portuguese wine, while berating my head with useless facts and figures, but rather to satiate every single one of my senses with care. From the dark shiny wooden floors that guided me into a large, open salon to the big comfortable chairs where I could just sit and enjoy the moment, she felt that each element needed to be thoughtfully considered from the student’s perspective. As Ryan walked around the room eagerly snapping shots of the decor, I took the opportunity to just sit and take in the room. The tall ceiling accentuated by the wide open windows and brightly colored walls made the space feel warm and inviting. To my left hung a floor to ceiling map of the wine regions, highlighted in bright autumn colors, giving me a clear indication as to where one region ended and another began. Straight ahead were several small bar tables in front of a partition. If I scanned my eyes down the partition to the right, I saw two very comfortable looking white bar stools below two flat screen monitors. 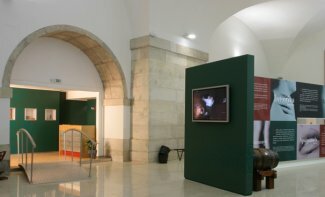 When Maria Joao returned, holding a small green spiral bound book, I asked her how the Sala Ogival worked day to day. She explained that every three weeks, three new regions are featured and displayed on the large banners that hung behind me on the wine bar wall. Every person who walks through their doors receive a tasting sheet and information about the three regions. After a full tour of the salon, they can sit down at any one of the small coffee tables and drink two wines from each region, free of charge. Ideally, assuming they are not packed with people – an occurrence that is becoming more frequent, one of the multilingual representatives can explain in more detail what they are tasting and how to fill out the tasting sheet. What is amazing for me is that each tasting sheet is then used for market research asking everything from “do you like the wine” to “do you think the label is attractive”. If you happen to like what you taste, Viniportugal can then sell you wine on the spot, avoiding the hassle of you finding a wine shop and lugging your wine back to your hotel. She went on to explain that the computers are available for people to learn more about the featured regions and the grape varietals. If they want information on the winery, they can bring up the winery’s webpage or general information, such as if the wine is being exported to their country. 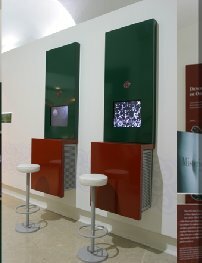 Maria João’s intention is to use the computers as you would in a school setting, as an educational tool. Eagerly guiding us to the other side of the partition, we encountered several large panels attached to the partition sitting side by side and decorated with a variety of fruit, body parts and poems. Handing me the small spiral bound book in her hand, I opened it and noticed the format was identical to what I saw on the panels in front of me, each page containing either a poem or a photo with titled with one word like “mystery” or “dreamer”. Looking more closely, however, I noticed that this wasn’t merely a beautiful book with flowing wine poetry, it was a scratch and sniff book! Featured for the 1998 World Exposition in Lisbon, ViniPortugal wanted to entice people into Portuguese wine by promoting it through the five senses. In order to appreciate wine, she emphasized the need to feel, smell, touch, feel and hear wine. Normally, she felt as if we rely solely on taste and ignore the other four senses. The book was a way for people to get beyond taste, and to connect with wine on a more profound level. I sat staring at the panels wondering if we really did ignore our other four senses? Do I just look at a glass of Portuguese wine and say, “yup, I think it tastes good”? I felt confident that I use a bit more of my senses than that, maybe not up to their full capacity, but definitely more than a mere swig and swallow. Yet, this may not be the case for many others. Someone recently wrote a comment on our website saying, “…here is a difference in wine blogging to food blogging – people eat from the day they are born and thus know (or should know) a lot of what they write about. Wine is different. The knowledge comes with experience and a huge number of people never get that knowledge.” I love this comment because it extends far past blogging and into the world of teaching, where wine is subject that is typically perceived as hauty and complicated. If organizations like Vini Portugal bring the conversation down to a sensual experience, suddenly everyone can relate. Regardless if you walk in their doors as a wine newbie or an expert, your needs have been thoughts of and your questions are completely welcomed. Sala Ogival is Free. Well-Equipped. Contains a Well-Trained Staff. And Comfortable. With soft Portuguese wine in the background and a hand painted glass in hand, I wonder if touring a crowded art museum would be nearly as enjoyable as sitting here chatting for hours over a Portuguese glass of wine. We don’t have a place like this here is Spain, and it breaks my heart to share this with you. Spanish wine is amazing, but I honestly cannot tell you of one Spanish wine organization that is easily accessible to the general public. Not one. I want this to change. I want to be able to share with you a place where you can go to have all of your questions about Spanish wine answered free of charge. I can tell you of regional organizations, but not national ones, and even those that are regional are rarely that helpful. If this does ever change, I promise to be the first one to walk through their doors, eager to spread the news! The following day, we swung by ViniPortugal to say goodbye to Maria Joao. As we walked into the salon, we were astounded by the number of people milling around the room. We had only seen the hall empty the day before, reserved for our private tasting, but now in front of us were dozens of people from all over the world tasting wine, looking upon the map and filling in their tasting notes. It was absolutely incredible! And in the middle of all this were the representatives of Vini Portugal, treating non-journalists in the exact same way they had treated us, with utter and complete respect, passion and attention. If you are ever in Lisbon or Oporto, we highly suggest that you arrange your plans to visit ViniPortugal during their office hours. Even if it’s only few a few minutes, we trust it will be absolutely worth your time. Has there been a wine organization that has effected you in the same way in your country? Open from Tuesday to Saturday between 11.00 and 19.00, it’s located in the Ministry of Agriculture premises in Praça do Comércio (“Black Horse Square”).